Permanent all-wheel-drive, a nine-speed automatic, SUV style and monster torque are some of the traits the all new Mercedes Benz GLC SUV Diesel obtains. A curvaceous body and loads of style are available in bucket loads to make the GLC SUV a very attractive new status symbol for Mercedes Benz. If you love a day on the ski slopes, this is the ideal vehicle for getting you up the slippery slopes. Clever AWD adhesion is monitored through a state-of-the-art computer system that uses active braking and torque control to best send grip to all the wheels. Cosseted in the very best Mercedes luxury, you will be enjoying the warm and luxurious interior regardless of the workload and conditions carried out by the GLC permanent AWD. To appreciate the talent of the new GLC-Class, the two diesel variants put forward a great case for opting for the diesel engine over the 2.0-litre petrol alternative. Such is the advancement in diesel engine technology, that the GLC SUV Diesel boasts engines that are very smooth, flexible and powerful. Regardless of engine revs, both the 220 d and 250 d turbo-diesels pull very hard from very low down. This makes for loads of grunt, which is just what you want when you are heading away on a long journey fully laden. Both diesel engines are 2143 cc, but a few tweaks give the 250 d 500 Nm of torque between 1600 – 1800 rpm and a peak power rating of 150 kW. This is not to say that the 220 d is weak. Just look at the 125 kW output and the awesome 400 Nm of torque from as low as 1400 rpm and up to 2800 rpm. Both offer great acceleration and are happy to cruise all day long at higher than average speeds. The nine-speed auto is standard and shifts extremely smoothly. Ride quality is first-class, and the chassis copes very well with rugged road undulations. Boasting air-suspension, the Mercedes Benz GLC SUV Diesel provides an ultra-quiet ride. To give you an idea, the new Mercedes Benz GLC SUV Diesel is actually smaller than a Mazda CX-7; the CX-7 being the medium SUV offered by Mazda. So what you need to remember is that the GLC-Class is aimed at the medium-size SUV market. If you require a bigger seven-seater Merc, then you’ll need to take a look at the GL-Class. Audi’s Q5, the Volvo XC60 and BMW’s X3 are also similar in size. So for a luxurious compact luxury SUV, then the new Mercedes Benz GLC SUV Diesel will be ready and waiting for you to come and check it out. You’ll be able to seat five occupants in superior comfort. Standard features in the all-new GLC-Class vehicles include: Bluetooth, dual-zone automatic climate control, push-button start, HD Radio, dual USB ports, an SD card reader, a collision prevention assist system, dual high-resolution display screens, a rearview camera, a driver drowsiness monitoring system and the Mercedes-Benz Pre-Safe system – which helps protect occupants if the vehicle detects an imminent collision. Other cool features include a 14-speaker Burmester audio system, an in-vehicle Wi-Fi hot spot, satellite radio, TuneIn Radio, a panoramic sunroof and voice recognition controls. 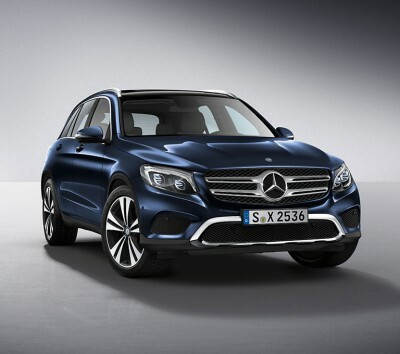 Safety on both GLC SUV Diesel models is very high, and it’s nice to know that you are in a modern five-star SUV. This means things like airbags all-round, ABS, 4-Wheel Disc Brakes, Brake Assist, Electronic Stability Control, Daytime Running Lights, Child Safety Locks, Integrated Turn Signal Mirrors, Traction Control, Blind Spot Monitoring, Auto-Leveling Headlights and a Lane Departure Warning system are standard. When lined up against some stiff competition, the new Mercedes Benz GLC does a great job of suggesting it to be the drive of choice. Certainly, the smooth transmission, and high level of luxury and style are some of its special points. For any more information on the Mercedes Benz GLC SUV Diesel or, for that matter, any other new car, contact one of our friendly consultants on 1300 303 181. If you’d like some fleet discount pricing (yes even for private buyers! ), we can submit vehicle quote requests out to our national network of Mercedes Benz dealers and come back with pricing within 24 hours. Private Fleet – car buying made easy!